Enjoy lunch with your fellow travellers at the Mercure Grosvenor Hotel this afternoon. Then, board a coach for your trip through the Adelaide Hills to the old river port of Mannum. Board the PS Murray Princess paddlewheeler on arrival. After settling into your suite, relax as the paddle boat cruises up the mighty Murray River, enjoying pre-dinner drinks and a welcome aboard dinner. During the evening the Murray River boat will cruise under floodlight to an overnight mooring at Caurnamont. Keep your eyes peeled on the Murray River bank as you may see nocturnal wildlife including grey kangaroos, hair-nosed wombats, Murray River long-necked tortoises and spoon-beaked echidnas. Settle in for a night’s entertainment by an on-board entertainer who will provide music for those of you who wish a late night. Daybreak comes on the Murray River and time for the keen photographers to be out to capture the special light and the morning movement of wildlife. Prolific bird life can be seen from the decks of the PS Murray Princess and includes pelicans, blue wrens and black swans. 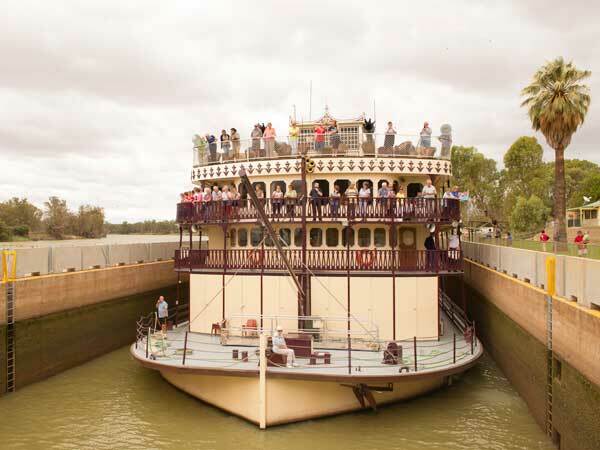 After breakfast it’s time to cruise the Murray River again, this time the paddlewheeler will cruise upstream to Blanchetown, through one of 13 locks which maintain the flow of the Murray River and levels of water. Shortly the river boat will reach Salter’s Station for overnight anchorage. This evening, as the last rays of the sun fade, you can join one of expert guides for a tour of Burk Salter’s vineyard on the banks of the Murray River, there is even time for a little wine tasting at the cellar door. After breakfast, join a guide for a walk along the eco-sensitive wetlands of Salter’s Station on the banks of the Murray River. Back onboard, the paddlewheeler will cruise down the Murray River, after lunch many passengers enjoy an afternoon nap, watch the Australian landscape slide by, or enjoy a lifestyle and info-cruising presentation. During the afternoon, your Murray River cruise will arrive at Sunnydale, here it’s all ashore for the Woolshed Sound & Light Show that recreates typical Australian woolshed history. Later that day, a visit is made to the Native Wildlife Shelter where some of South Australia’s most interesting native animals are cared for. That evening your chefs will prepare a great Aussie Barbecue cooked and served in a bush setting on the banks of the mighty Murray River. After dinner, you will be treated to a nocturnal eco-tour by tractor and cart. 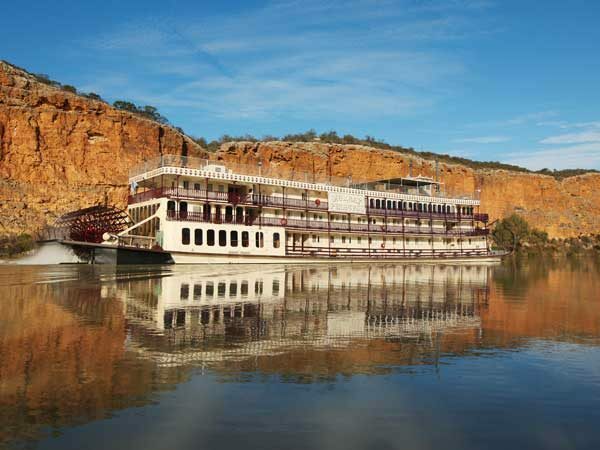 After breakfast, the PS Murray Princess slowly cruises downstream along the mighty Murray River past magnificent cliffs scoured by the Murray River over millions of years. 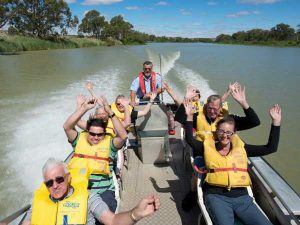 The next stop for the paddle boat is Ngaut Ngaut Aboriginal Reserve, one of Australia’s most significant archaeological sites. Take a step back in time tens of thousands of years and join a knowledgeable guide for a boardwalk view of ancient rock carvings and learn about aboriginal history in the area. 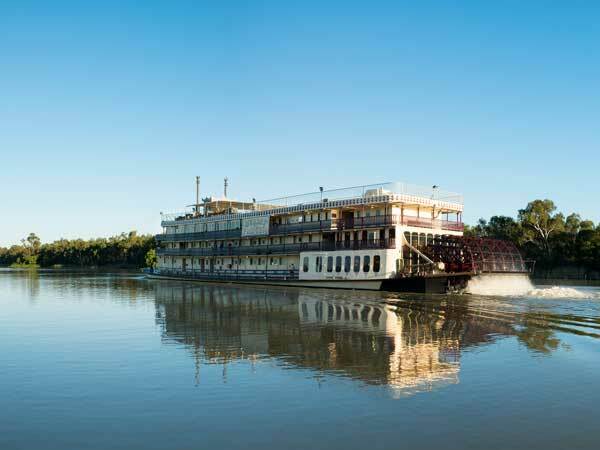 Back onboard, the paddlewheeler will cruise down the Murray River to Younghusband. Along the way, adventure seekers can also take a speed boat ride. The PS Murray Princess will cruise past large billabongs, open expanses of water and cliffs amazingly high. Tonight, the Captain and his officers host a spectacular farewell dinner onboard the PS Murray Princess. 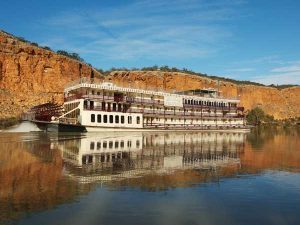 This morning the PS Murray Princess arrives at Mannum where all new friends and crew reluctantly say farewell after breakfast on board. We are then transferred by coach returning to Adelaide. ou will be dropped off at your hotel in Adelaide at the end of your tour for your overnight stay.